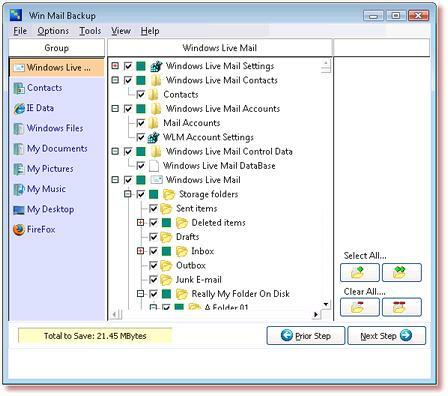 Win Mail Backup is an easy to use utility to backup all of your Windows Live Mail or Windows Mail as a single compressed, backup file. You can easily view messages in the backup; or restore the messages or the mail folders. WMB also saves and restores "My Documents", the Desktop, Firefox and Internet Explorer data. WMB will also assist with the transfer of mail from Windows Mail to a different machine. ...... and restore IE favorites, cookies and offLine web folders in addition to WLM or WM data; backup and restore WLM/WM message rules, mail accounts, and critical registry settings. Win Mail Backup will assist with the transfer of mail from WM or WLM from one machine to another. WLM can also transfer WLM data from XP to Vista machines (and vice/versa). Win Mail Backup includes a backup and restore of "My Documents", the Desktop, as well as the Firefox browser data. Win Mail Backup is designed for all levels of user. The novice will find the Win Mail Backup wizard interface simple but powerful, while the advanced user will appreciate the built-in scheduler. Win Mail Backup program includes a "Live Update" function to ensure that you always have the latest version of the software. Win Mail Backup supports Windows Mail 7, Windows Live Mail and it works on Windows Vista or XP systems. Qweas is providing links to Win Mail Backup 2.0.0 as a courtesy, and makes no representations regarding Win Mail Backup or any other applications or any information related thereto. Any questions, complaints or claims regarding this application Win Mail Backup 2.0.0 must be directed to the appropriate software vendor. You may click the publisher link of Win Mail Backup on the top of this page to get more details about the vendor.